i know i have not been blogging much and i am really sorry for that. so here i am reviewing the inglot lip paint that i had got a month back and most of my readers wanted me to review this very product. i am really sorry to keep you waiting.. Along with the lip paint i had asked my brother to get the m3 eyeshadow palette and the t30 brush but it was not available.. but the good news is that my bro in law is in London and i handed over a i can't say big but a not very small list of both mac n inglot products to him and i am really very excited as he called me up and said that he's got all of them. he'll be returning after a few days. I got this for rs 720/-, a bit pricey but totally worth it. it smells a bit fruity and i love it, not to strong, coz i am a bit allergic to strong smells. I am simply loving it..
it come in a pot so, since i have long nails, i am scared putting my fingers into it therefore, i use a lip brush with it. Can't think of anything else right now. but nothing much to unlike bout the prods. 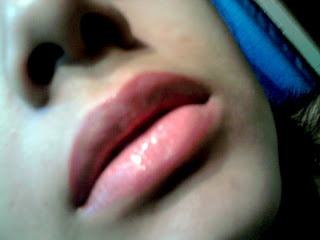 this is how it looked on me.. though i applied a very little bit of it with the help of a lip brush, after using a lip liner. 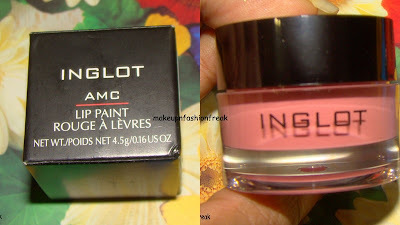 hi beauty addict ty n yup it is pretty pigmented its only dt i have applied a very lil bit of it..